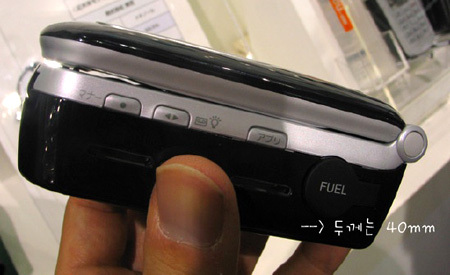 Toshiba's Methanol Powered Cellphone | OhGizmo! I don’t have a whole lot of information on this one, except a few bits here and there. I know the name Toshiba was mentioned, coupled with the “methanol powered” buzzwords. So, I’m just guessing here… it’s a stretch, but could this be a methanol powered cellphone? Aside from that, I hear it’s 40mm wide thick (Holy Crap! ), which is mammoth-y if anything, but you know, it’s powered by nature’s fart, so that makes it interesting. If there are any of you Japanese enabled, perhaps you can enlighten us by translating this page for us. Or is it Korean? Update: We got us some English, right here. Thanks Tobiasu. hey guys, nice pic. It’s korean in the picture, saying dokkaenun – I’m not 100% but it’s thickness. Not too bad, considering… imagine trying to explain to the gasstation-guy why you’d like to buy just a millilitre fuel. And how to fit the hosepipe into the phone! Well anyways follow my link, it goes straight to englishificationalized automagically superversione prontoyes of the one you requested translation of (the site’s in japanese).